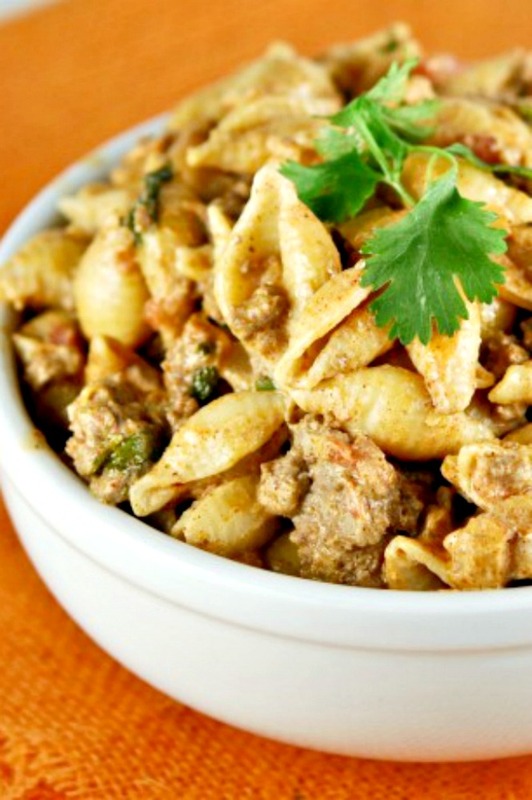 Easy Hamburger Hash-Easy To Make Family Comfort Food! 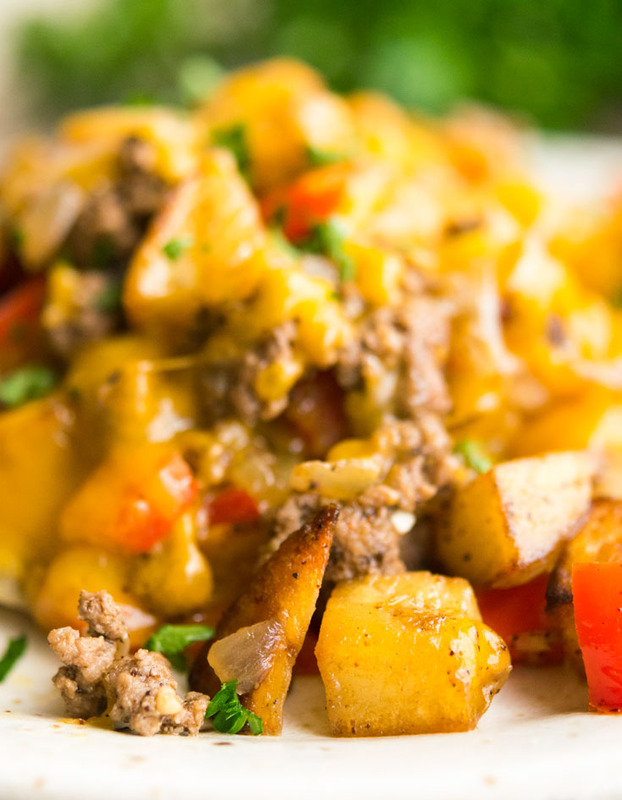 Hamburger Hash is wonderful family comfort food that combines seasoned potatoes, veggies, cheese & hamburger to create an easy one skillet meal. 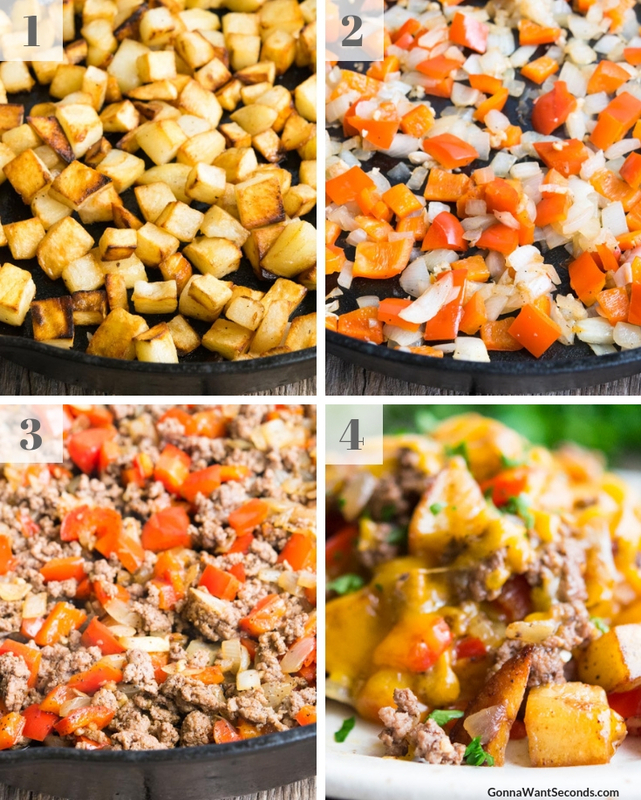 Hamburger Hash brings together chopped potatoes, veggies, and ground beef in a one skillet wonder that your family will love. 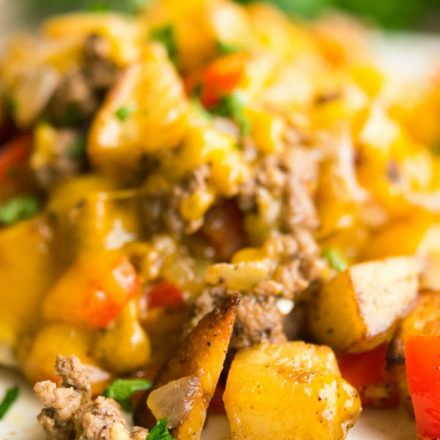 The simplicity of this Hamburger Hash recipe makes it perfect for a busy weeknight supper. It’s also an excellent way to use leftovers! Hash comes from the French word ‘hacher’ or ‘to chop.’ Everything about Ground Beef Hash has a rough chopped, rustic feel to it. 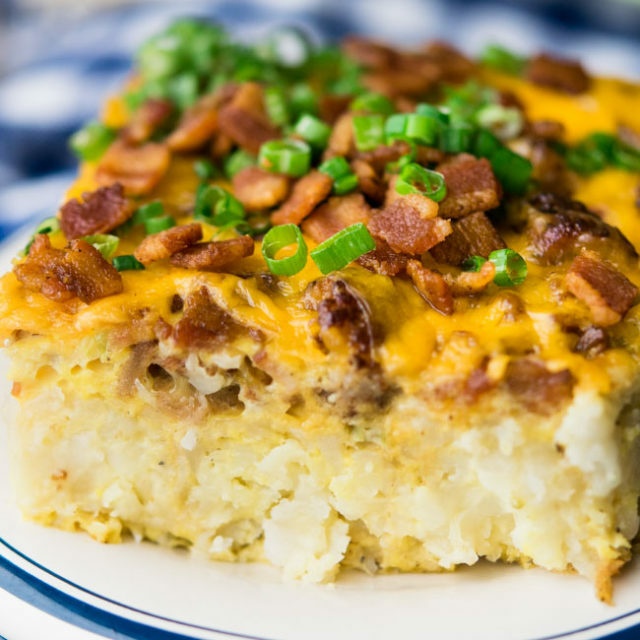 This recipe has a nice cheesy top, but if you like a super Cheesy Hamburger Hash, feel free to experiment with some in the filling or add different blends of cheeses. I don’t think you can ever go wrong with cheese! One awesome feature of hash is that you can’t do it wrong. Hash is great for leftovers since there are no rules as to what goes in it! Add some veggies like cabbage, green pepper, or corn, and just like that, you’ve created Hamburger Hash Supreme. A traditional Ground Beef Hash Recipe calls for chopped potatoes, but rice can be substituted for the potatoes to make Hamburger Hash with Rice. The rice brings a different texture but is just as delicious and filling as the original. Hamburger Hash with gravy adds a delicious sauce to the ensemble that just begs to be mopped up with a crust of bread. 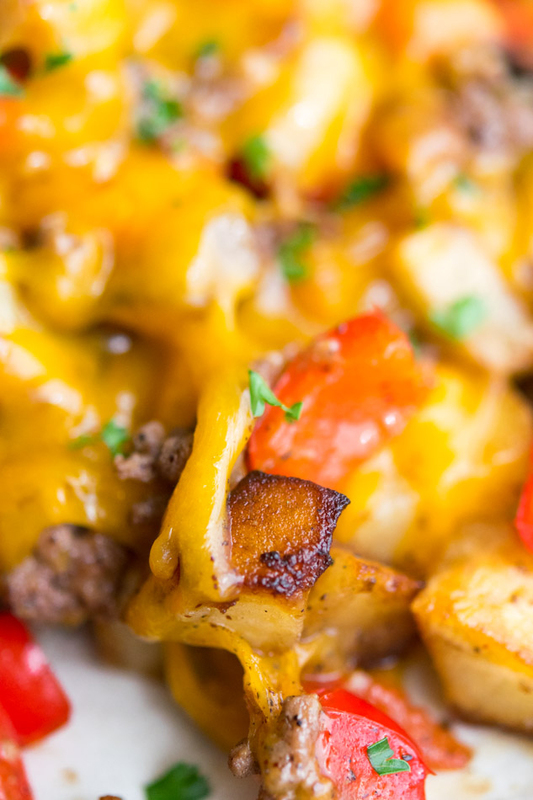 Hamburger Hash is a main dish that incorporates ground beef and chopped potatoes in a single skillet meal. It’s quick and easy to pull together and is perfectly spiced to please even the most delicate pallets. 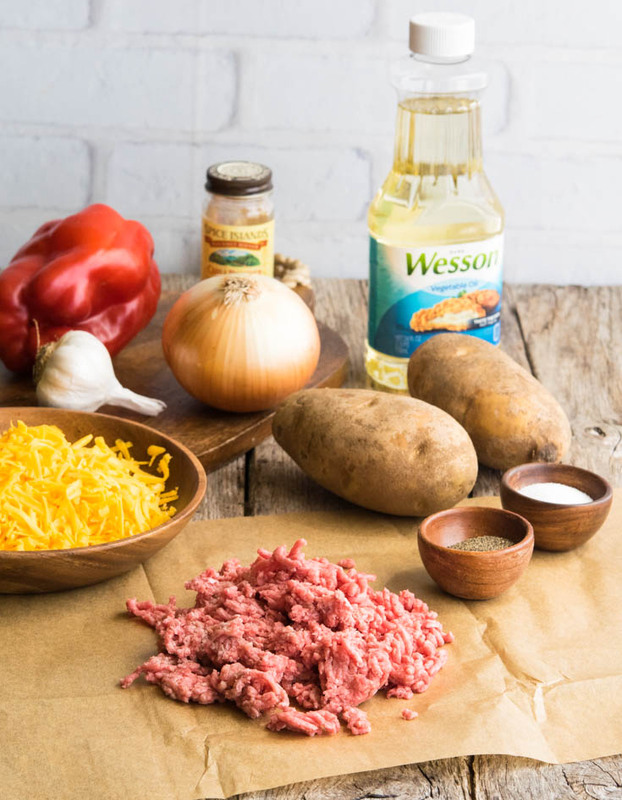 What Ingredients Do You Need To Make Hamburger Hash? Onion, bell pepper, garlic, chili powder, salt, pepper, cheese, ground beef, and potatoes. You’ll also need a splash of vegetable oil. Add a bit of chili pepper and cheese as finishing touches, and you’ve got all the fixings for Hamburger Hash. Start off by chopping the onion, pepper, garlic, and potatoes. Cook the potatoes in the oil and then add in the onions, pepper, garlic, spices, and ground beef. Cook until the beef is done and then top with cheese! 1. Peel and cube potatoes. 2. Place it in a bowl of cold water. Swish the potatoes around to remove starch. 3. Drain and rinse it in a colander. 4. Spread the potatoes on paper towels. Pat dry. 2. Add the onions, bell pepper, and garlic on the skillet. Cover then stir until golden brown. 3. Add beef, chili powder, salt, and pepper. Cook until brown. Drain excess fat. 4. Mix potatoes back in then sprinkle cheese on top. Place skillet in the preheated broiler until cheese is melted. Serve. 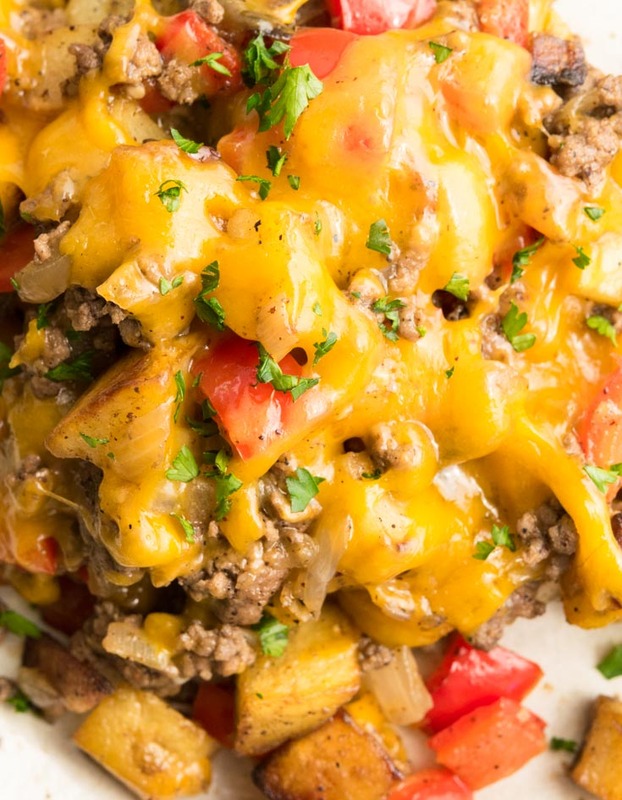 Hamburger Hash, with it one skillet prep, combines seasoned potatoes, veggies, & hamburger topped with cheese for a simple toss together, yet filling meal! 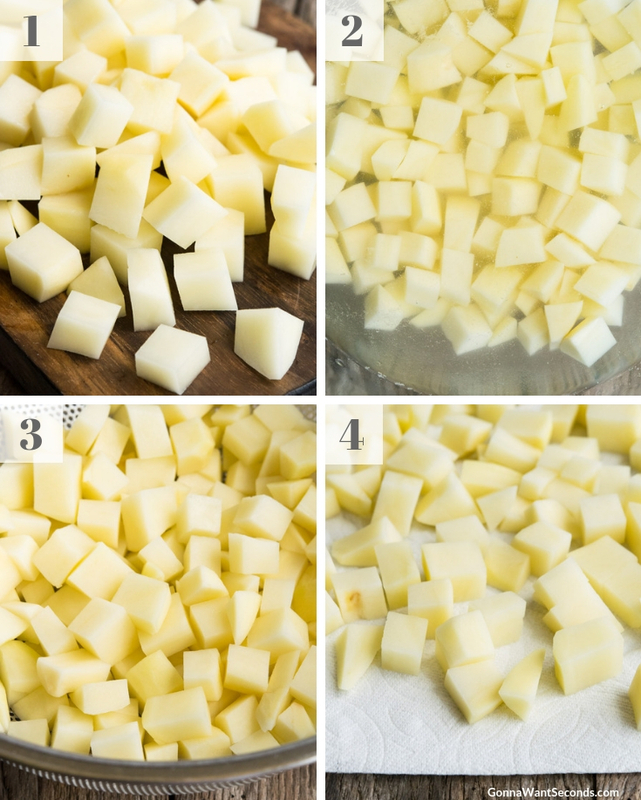 Peel the potatoes and cut them into small cubes. 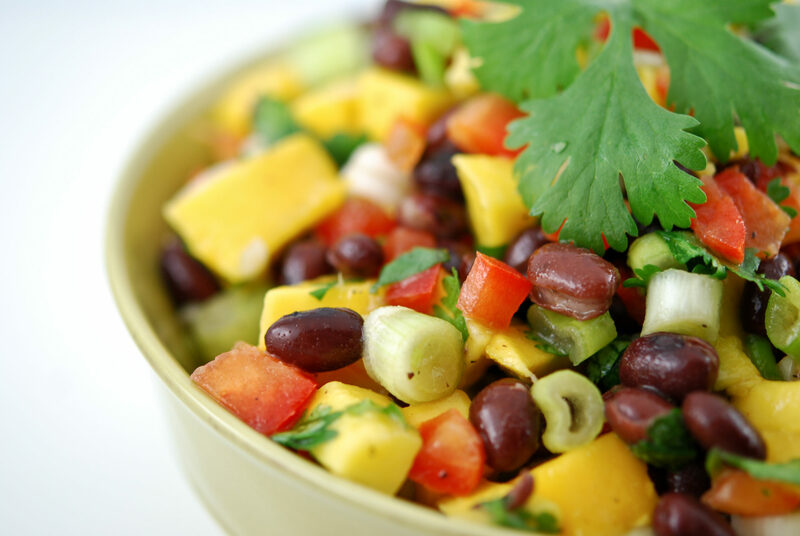 Place cubed potatoes in a bowl of cold water, swishing them around to remove starch. Drain in a colander and rinse. Spread potatoes out paper towels and pat dry. Add oil to a cast iron skillet and heat over medium-high heat. Add the potatoes and cook, stirring as needed, until the potatoes are fork tender and browned on most sides. Sprinkle potatoes with 1/2 teaspoon salt and 1/4 teaspoon black pepper. 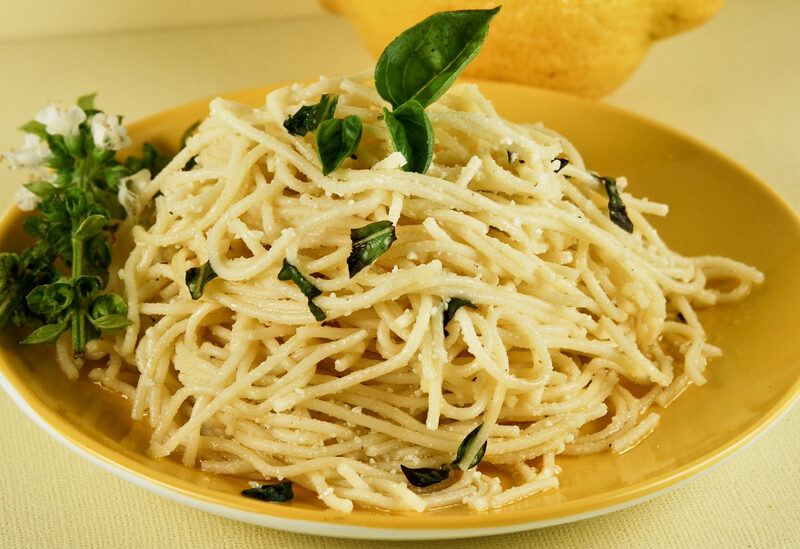 Transfer to a plate and set aside. Stir in the onions, red bell pepper and garlic to the skillet. Cook over medium heat, stirring until golden brown. Stir in the beef, chili powder, and 1/2 teaspoon salt, 1/4 teaspoon black pepper and cook, breaking up any clump, until brown, about 5 minutes. Drain any excess fat. Add the potatoes back to the skillet and mix in. Sprinkle cheese evenly over the top of the skillet. Place skillet under preheated broiler until cheese is melted, about 1 minute. Serve. The recipe calls for Russet Potatoes, but any good starchy potato will do. Potatoes high in starch fry up with nice crispy outsides and fluffy tender middles. 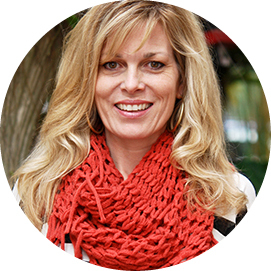 Don’t skip the cold water rinse. You’ll miss out on a nice crisp outside to the potato if you do. Heat your oil before you put in the potatoes. This will help decrease the amount of oil the potatoes absorb and produce nicely browned sides! The potatoes take the longest out of everything to cook. The smaller the pieces, the faster they’ll cook through! Aluminum foil: If you are like me, you were taught growing up that there is a crucial difference between the shiny and dull sides of foil. One side, the shiny side, should face the food when cooking, and that same side should face outwards when cooling…or so we were told. The shiny side was supposed to be more reflective, and thus best to face in the direction you wanted the heat waves to go! It turns out that the difference in reflectivity is negligible. So wrap away with careless abandon! Still skeptical? Check out Reynolds’ heavy duty aluminum foil FAQ’s to hear it from the horse’s mouth. Can You Make Hamburger Hash Ahead Of Time? Hamburger Hash can absolutely be made ahead of time. You’ve got a couple of options. If you’re preparing a few days ahead just, it’s best to chop everything, except the potatoes, and store them in individual containers in the fridge. Cook and season the hamburger and store it as well. When you’re ready for it, chop and cook the potatoes as instructed and then add everything else as usual. Since the meat is cooked, it just needs to be warmed through. 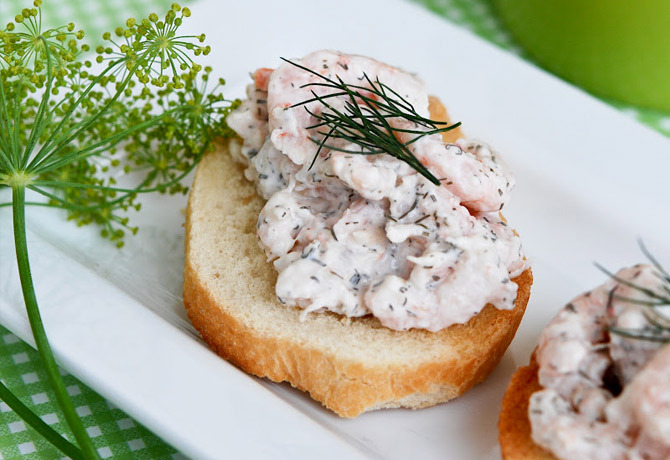 You’ll be able to whip this up in no time! You can also cook everything in the skillet as instructed, but I suggest holding off on the cheese. You can reheat just before serving and then top with the cheese. Your potatoes might not be as crisp with this method. Can You Freeze Hamburger Hash? Freezing Hamburger Hash is another great way to make the dish ahead of time or save the leftovers. To make ahead: make the dish in its entirety and allow it to cool. Transfer it to a casserole dish and cover with cling wrap, followed by a layer of foil. Remove the cling wrap to reheat. Bake covered with foil until heated through. Your potatoes might not be as crisp with this method. What Do You Serve With Hamburger Hash? Hamburger Hash is a pretty complete meal all on its own, but a nice green vegetable as a side compliments it well! Broccoli, green beans, or a simple salad are all good options. A nice crusty freshly baked loaf of bread is absolutely divine and is perfect to round out the meal. 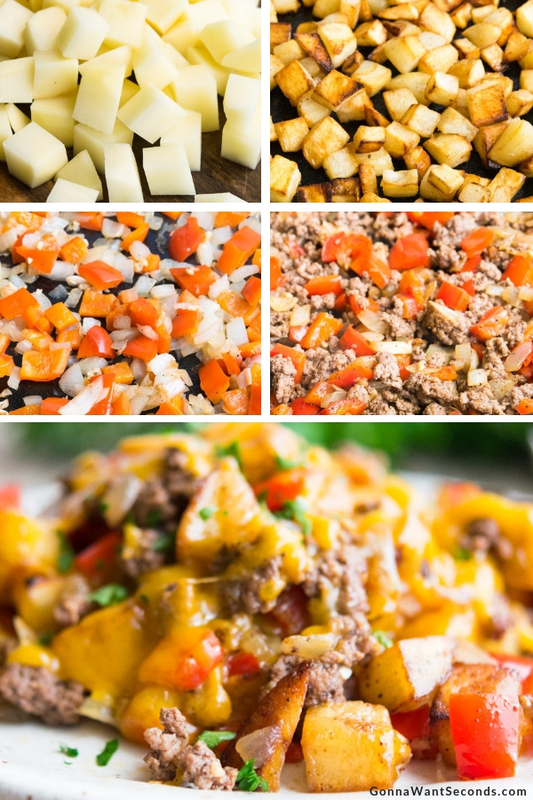 Hamburger Hash Slow Cooker style is a great fix it and forget it meal, and Hamburger Hash Brown Skillet recipe fries up in a snap on the stove and has the added convenience of using frozen hash browns! You can even skip the skillet altogether by trying Hamburger Hash Casserole and bake it instead of frying it on the stove top. Again, it’s hard to do hash wrong! Hamburger, which traces its origins to Germany in the mid-1880’s, is a versatile, economical ingredient that can be the foundation of so many wonderful dishes. 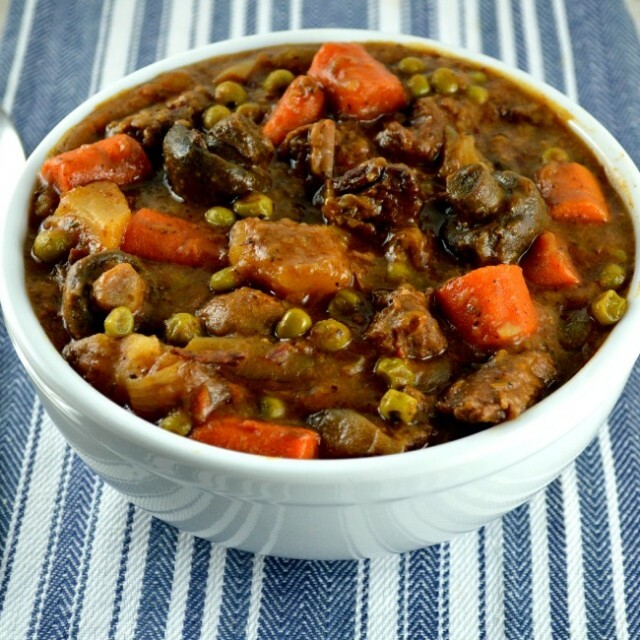 An Easy Hamburger Soup is the perfect way to warm up after cool days spent outside. Hamburger also is the star of the show in the family-pleasing Hamburger Casserole with its cheesy sauce and bow-tie noodles. Of course, who can forget the humble Hobo Dinner with its hamburger patty and veggies wrapped in foil? Often associated with camping, Hobo Dinners are great for around the fire or fresh from the oven at home! Hamburger can do so much more than just sit between two buns! Previous RecipeOlive Garden Five Cheese Ziti Al Forno – A Delicious Copycat Recipe!